As I have said many times before, one of the ‘issues’ with the PDF spec is that some files can have a huge number of errors and still open. Adobe Acrobat has a large number of built-in fixing tools, so often the best solution is to open and recieve the PDF file. I have been looking at a good example today…. However, this is what I found in this PDF file. Some random data has been appended to the file. This is a problem because the PDF file contains a large number of tables which use offsets from the start of the file (assuming that to be %PDF). How to handle these sorts of cases is not formally defined and different tools will handle it in different ways – we do not currently allow for it for example. It really depends on what sort of ‘rubbish’ files the developers of a library have met. Generally the best solution with these files is to open and resave in Adobe Acrobat. This has some very powerful tools to fix and repair PDF files. 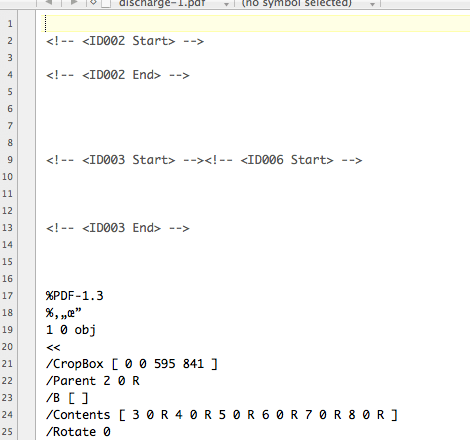 Interestingly, the PDF I have been looking at drops from a size of 318K to 278k and now works in all PDF tools. « Updating properties, time for a resolution. 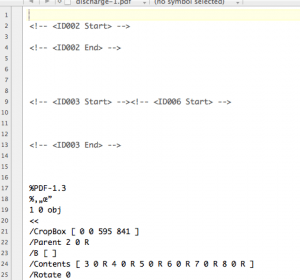 I actually worked on some printer based software a while ago where every now and then the 1024 bytes that Adobe software checks was not sufficient, and I wrote a custom routine that would search for the PDF header in the first 100kB of a file. This was necessary because of prepended print ticket information. Thanks for adding your detailled explanation. You would not get that kind of tolerance in any other filetype. I think this comes from the PostScript legacy that PDF still carries around with it: WIth PostScript it was possible to pre-pend a print ticket in the form of PostScript comments. 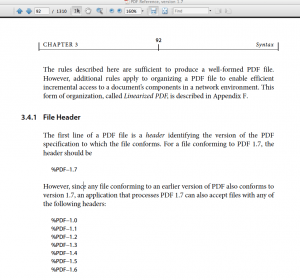 A lot of printers still use either PostScript or PCL commands to switch emulation modes, so in order to switch a printer into PDF mode, it may need a couple of lines of PCL or PostScript before the actual PDF content. This is fine if you are going to a printer, because that printer will “know” and will be able to strip that extra content out before processing the file. If the user however decides to save that “PDF” to disk, you end up with what the PDF parser considers garbage before the PDF file header. 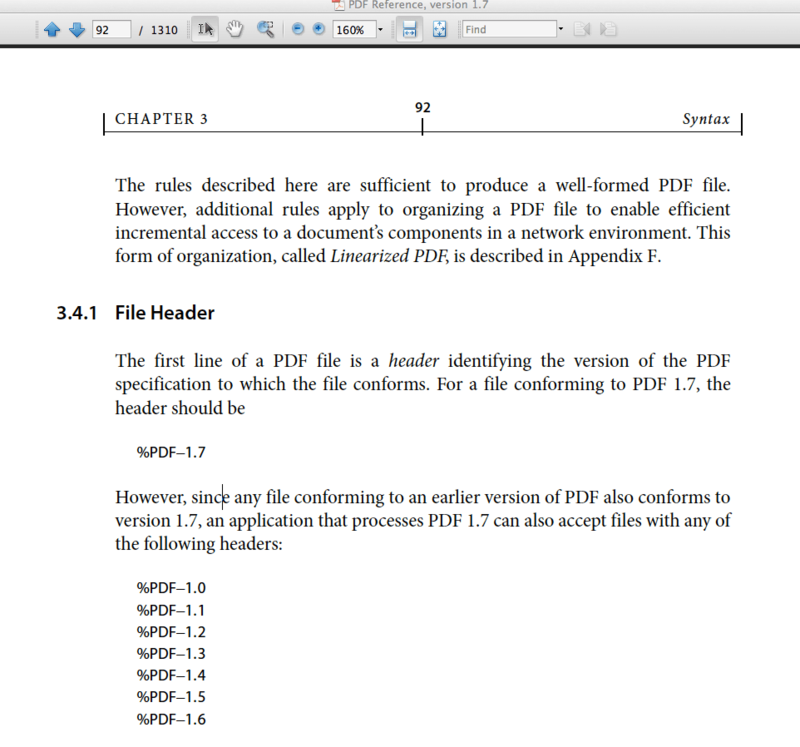 When working with PDFs, the approach you should take is then when you create PDF, you need to stick to the spec, but when you read PDF files, you need to be as open and inviting to all those non-conforming PDF files as possible. I would not go as far as Adobe goes in Acrobat and Reader where they repair severely broken PDF files, but I usually provide some accommodation for non-comforming files. That still makes sense but we could not think of another filetype with that level of ‘flexibility’.